Oliver Rackham is the subject of this week’s Really Like This Book podcast scripts catch-up. 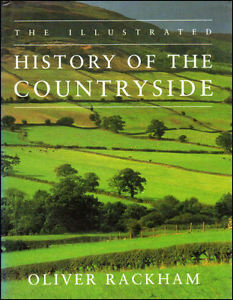 He wrote a lovely and really rather long History of the Countryside, which came out in 1986. I gobbled it down with great enthusiasm when I first read it, because then I was working in archaeology, and was very much into exploring the lumps and bumps in the British landscape. Rackham’s book is a detailed explanation of what the lumps and bumps are under our feet as we walk through the British Isles, how plants and animals have improved and altered them for their purposes, and why. Rackham is a historical ecologist, studying how the natural world worked and works: not just plants and animals, but also geology, weather and time. Rackham’s sense of time is a little more elastic than ours. At one moment in this book he will be considering geological time, in the formation of pingos and other landscape hollows over hundreds or thousands of years. In the next moment, he will be angrily showing us how the short-sighted practices of only a few years have permanently destroyed a landscape, or the chances of a tree or butterfly to regenerate. Rackham is absolutely not afraid to disagree with current conservation practice: one of the reviews of a recent book of his on trees calls him a slightly grumpy high druid. 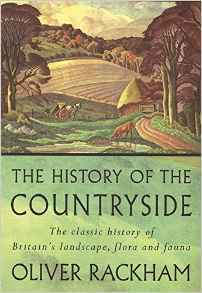 The History of the Countryside ends with a scathing concluding section called ‘conservation’, which really ought to have been printed in the colour of irony, since Rackham considers that ‘conservation’ is doing it all wrong. When he does give praise, it’s generous, but he didn’t find much to give in 1986, or 1994, when he reissued the book in an illustrated format, with updated arguments. He doesn’t suffer fools gladly, and doesn’t spare any of the land authorities who got it wrong. 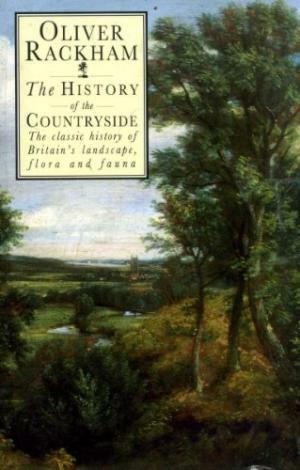 The History of the Countryside starts small, and goes wide-scale and large-scale, moving from animals and plants, through woods, fields and trees, to grasslands, moors, ponds and the sea. But before all that, we have a master-class on how to spot things to look for in the landscape. This is where we learn to become amateur historians, looking at place-names, the written records, and parish boundaries. If you live in a place with a Norse name, the chances are that it was founded by Viking migrants in the middle centuries of the first millennium. If the field at the back of your house is called Beech Field, it’s likely that it was the only beech tree around for miles, and was a landmark, rather than a landscape full of beeches. If the local wood is called Beare Wood, it’s probably over a thousand years old, because of its Anglo-Saxon name. Rackham is very strong on looking at the real landscape, getting away from the computer screen to stand in the mud of the real thing. If you’re looking at your parish boundary on a map or on the ground, and can see a lot of very odd zig-zag angles, this would be a sign that the parish was established on ground that had already been divided up into strips of fields, which means the settlement was old, and that parish administration was a piece of modern interference. Plants are important for telling you about the ages of things. Every plant can be used as a way to measure the passage of time. If you find oxlip in a wood, that wood is over a hundred years old. Lichen are excellent indicators of how polluted the air has become. Animals that we think are native, like rabbits and squirrels, might be naturalised, or introduced, and the reason for their introduction is worth investigating. I think it’s on trees that Rackham is most eloquent: trees and hedges and what you can do with trees to harvest them, over the centuries. There are no trees mentioned in Domesday Book, which does not, of course, mean that Norman England had no trees, but that they were so common, and so normal, that they weren’t worth recording. Trees can be odd. Did you know, for instance, than an elm tree is very likely to be a clone of all its elmish neighbours? (If you are lucky enough to know of an elm that escaped the Elm Disease that devastated British elms in the 1970s.) If you’re standing in a patch of woodland that has a lot of elms in it, you’re actually looking at one single organism. It’s a rather unnerving thought, when you think about the suckers and root systems all connecting to each other, under your feet, but think also about what this structure does for their susceptibility to disease. A fallen tree is not necessarily a dead tree, and horizontal trees live comfortably and usefully for centuries in a prone position. Even a dead tree is still useful and beautiful: it’s a home for insects and very small mammals; it’s an excellent playground for less small mammals; it lets other plants grow up around it by removing the leaf canopy above, and it looks terrifically dramatic in photographs.Techniques for managing trees and using them sensibly include coppicing and pollarding. Coppicing is when you cut the tree off at the ground, leaving the root to sprout again and produce a ring of younger trees from the same rootstock. Not all trees like this treatment. Pollarding is the same principle applied higher up the trunk, to keep the young trees out of the reach of browsing deer. 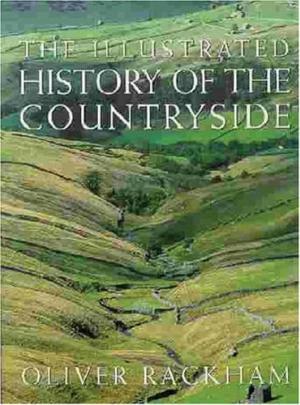 With his section on boundaries and hedges, Rackham moves away from how people have farmed the natural resources, to how they reorganise the land. Medieval field systems are extraordinarily complicated, but they make so much sense if you think of them as a perpetual cycle of land use, in different stages and places. Hedges are terribly complex, and also very simple: each species of plant living in a one hundred-metre stretch of hedge represents a century of the hedge’s age. Roads run alongside hedges, and walls, and can be older than human habitation: deer and rabbits made the tracks that we still follow today. Prehistoric roads often have two versions, one for summer, on the lower ground, and one for winter, on a ridge, to get away from the mud in the valley bottom. Roman roads can be distinguished between those built in a hurry, on the march to relieve or attack another area, because these paid no attention to natural obstacles or existing landownership, and just pushed steadily through on a straight line for hundreds of miles. The other kind of Roman road, built with a little more leisure, changes direction slightly at each high point on the route, when the surveyor decided on the new day’s direction. Old roads needed old bridges: did you know that the Anglo-Saxons built a ten-span wooden bridge over the Medway, the wide tidal river south of London and the Thames? We know almost nothing about Anglo-Saxon wooden structures because wood rots, and so nothing is left, unlike the stone bridges built a few hundred years later by the Normans, many still in use today. Roads to bring animals over the hills to market were long and curved. Roads that run between settlements in wooded farming country get deeper and deeper until they’re practically underground, hidden under an overhang of massive tree roots. Roads over empty rain-soaked moorland that were abandoned centuries ago might still have their original Roman flagstones, a centimetre or so beneath the mud. Moorland is another Rackham passion. It is so apparently empty that it’s commonly assumed to be worth nothing, to contain nothing, and to be a good place to put things, like roads and houses and trees. If that happens, there’ll be no more moorland, no more habitat, no more hidden archaeology, and no more untouched wild space. Britain is such a small European country, compared to the vastness of France or Germany, and is an insignificant speck compared to Russia’s acreage. The surviving areas of open land in Britain are perpetually threatened by being eaten up with bracken or pine plantations, or dug up for fuel or garden compost, as well as being built on by roads and new housing. Rackham gets very angry indeed about the destruction of moorland by tree-planting because it was, in the 1908s, so clumsily done, and ill thought-through. My favourite section of the book is about the holes in the ground: the ponds and dells and pingos and marl pits, mainly because they’re so mysterious. Geology forms them, people use them, animals fall into them, and plants silt them up; all that information can to be untangled, and still nobody really knows why they’re there, and how. I love the idea of meres that fill up with water during a drought, and empty in times of great rain: what mechanism causes that? I‘ve been down into the prehistoric flint mines at Grimes Graves in Norfolk, and they are truly as weird and beautiful as they look in the photos. Fish ponds and moats are familiar, but did you ever hear of a duck decoy before? It’s a pond with arms to chase ducks into, and then catch them at the closed end, for market or for the pot. The History of the Countryside ends with the fenlands and the sea, which is nibbling away at the British coastline with increasing vigour. Cliff-top buildings are falling into the sea all along the east coast, and villages are sliding, very slowly, underneath the waves. Before the whole island gets washed into the North Sea, we need to go and look at it, and Rackham thoughtfully gives us 8 guided walks, with maps, photos and explanations, so we can see the things he’s telling us about. We have a Cambridgeshire walk (obviously his own stamping ground), a Highland walk in Aberdeenshire, a walk through Queen Elizabeth’s favourite forest in Essex, a walk through Swaledale in North Yorkshire, a look at the Lizard Peninsula in far south-west Cornwall, a robust walk in south Wales, a nice decorous Home Counties walk past Guildford, and a bracing seaside walk in North Norfolk. I think there’s something for everyone there. 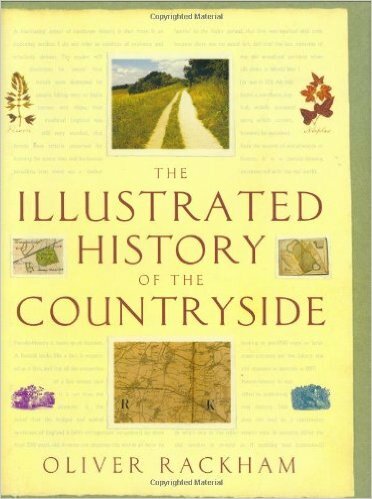 If you enjoy a more scientific text, read Oliver Rackham, The History of the Countryside (1986). If you need the photos and maps to understand what he means by a braided river or a pollarded lime, look for Oliver Rackham, The Illustrated History of the Countryside (1994). Lovely piece, Kate. I spent a day with OR once, recording in an ancient wood in Suffolk for a series called ‘Trees’. A really interesting country-man: still alert and curious. And wise. oh ENVY. I’d love to meet him. Thank you for this–if the book is as fascinating as your review, it will be money well spent. I don’t live in England, but this is just the sort of natural history I love.